Up the stairs, past security and into the venue; eyes quickly adjust to the darkness as the ears are immediately pummeled by the sounds of Sydney band, The Amenta. They’re clearly stoked to be here, sharing the stage with such big names on the metal scene; however the mix is sadly letting them down. There’s just not enough guitar or bass in it – the typical support band curse. Singer Cain Cressall stalks the stage regardless, arms flailing as he huffs and growls his message into the half-filled room. They might be an energetic live band with plenty of presence, although for the most part they don’t wear their makeup with enough conviction to pull it off; despite the possibility that their keyboardist is a little psycho. They’re definitely a band to watch as they continue to grow and develop. Maybe try and see them on a headlining gig when the mix will do their layered cacophony some justice. Hailing from New Orleans, Goatwhore take to the stage next and immediately start giving the PA grief as it struggles under the weight of their groove. Their mix of styles is reminiscent of old-school thrash, a bit of Motorhead and some blackened death for good measure. It’s practically seamless, and they lurch from one style to the other like they were born to do it. Singer Ben Falgoust invokes the devil horns and the crowd responds in kind, silhouetted by the stage lights – a small circle pit opening up a few rows from the front. The band are empowered as they move freely about the stage working the burgeoning crowd, diminutive guitarist Ben Stout almost hidden by his EX-series ESP guitar, never looking up to witness the carnage he’s created in the pit. They’re a band with some pedigree, and it shows in their performance. Moments after Goatwhore’s final notes ring out, the audience has, for the most part, evacuated into the bar area or down the stairs and onto the street for nicotine relief. The metal scene is, while not without its faults, awesome. The vibe in the room is light and happy as friends and strangers mingle, regardless of what band name is emblazoned across their t-shirt or what hair style they choose to wear. The gig may be all-ages, yet there aren’t many visibly under age fans in the crowd, save for one 17-year-old who seems unsure of himself, still searching for his identity as he dons a beanie and striped fingerless gloves. His friend, an 18-year-old student from China is the only one to arrive wearing face paint. He’s a diehard Behemoth fan, claiming he’s been into them since ‘Demonica’ came out in 2006, genuinely stoked to be part of it all. A couple of double JDs and it’s time to re-enter the darkness for Job for a Cowboy. The sound mix has magically improved, to the point where drummer Jon Rice’s kick drums risk causing spontaneous bowel movements in the audience. Singer Jonny Davy’s vocals are deep and guttural, implying the work of someone more advanced in years and he’s the highlight of the group, pacing the stage for the entirety of the set, owning the crowd below. From his half-pace head bobbing, you’d be forgiven for thinking that bass player Brent Riggs was off chops – and he probably was. They’ve certainly shed their ‘MySpace’ origins; their latest album ‘Ruination’ makes good progress over their last, despite the shock departure of founder member and guitarist Ravi Bhadriraju in 2008. When Davy pumps his fist into the air, the crowd follows like a retarded cricket crowd mimicking their favourite player as he warms up. The audience is whipped into frenzy; the circle pit opens up, swallowing a dozen rows of people and more than seem comfortable being involved. However, their set lacks something overall and it wasn’t the music. Some may argue that death metal doesn’t require showmanship akin to rock groups or regular metal bands. But that’s what is lacking for Job for a Cowboy. 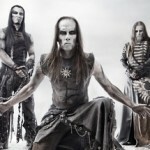 If it were true, then apparently no one told Behemoth, who left no one guessing as to who the real headliners were. Despite a sound check that would have made Axl Rose proud, the band took to the stage with all the grandiose theatricality of a West End play. They have it nailed. They’re polished, dramatic, rehearsed and as tight as a pack of school girls. Behemoth chose not to play music before their set. Instead there was a low, incessant rumble and the occasional digital artefacting that was reminiscent of some atmospheric Nine Inch Nails piece crossed with that unnerving hum industrial air conditioning systems produce. It set the scene for the unholy circus that followed. The band obviously takes their craft very seriously, entering the stage like possessed undead killers who’ve zeroed in on their next target. Bass player Orion cuts an imposing figure, at well over six foot tall, he’s like a zombie Peter Steele back from the dead. He dwarfs his custom ESP bass, staring motionless and stony faced like some kind of monster. Singer/guitarist/ring leader, Nergal somehow manages to be Mr. Charisma and a soulless purveyor of all things evil at the same time. He’s a man possessed, working the crowd like a Pied Piper and creating a mosh that lasts the duration of the set. It’s truly a sight to behold and the sound mix is a devastating 100%. Behemoth is evidence of Europe’s dark history and their ability to feed on it and create such intense music is awe inspiring. The band is muscular, regimented and disciplined. You can see it in every movement, every facial expression (or lack of)… it’s almost military precision taking musical form. It’s glorious theatre as only the Europeans seem able to pull off convincingly. After an hour of destroying everyone in the room, the band leaves the stage with Nergal dramatically throwing his guitar to the guitar tech who risks being impaled on its sharp edges. No one in the crowd moves a muscle; knowing, hoping they’ll come back out for an encore. Moments later the lights dim and the band return, donning wickedly evil masks, completing the inhuman image they wear so well. 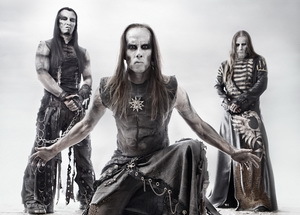 Nergal performs the song with his band mates flanking him left and right, hardly moving a muscle beyond those required to play their instruments – their masks hiding any humanity from the audience. The lights dim again and they leave the stage in the darkness – the end of the play and a perfectly choreographed ending to a perfectly dramatic performance.